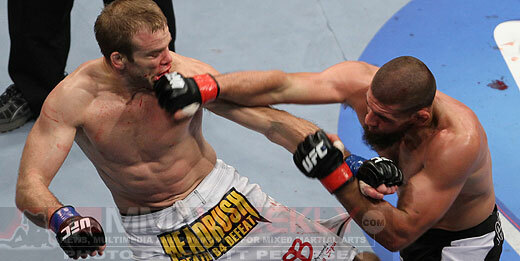 Court McGee cracks Ryan Jensen at UFC 121. Court McGee will have to wait a little while longer before making his return to action. The former “Ultimate Fighter” winner has been forced out of his scheduled bout with Jesse Bongfeldt at UFC 131 after he tore his MCL in training. McGee’s removal from the bout was confirmed by sources close to the fighter to MMAWeekly.com on Monday. MMAJunkie.com first reported the injury. According to the sources, McGee injured his knee while training at Cesar Gracie’s camp, working with the team as they prepared fighters like Jake Shields, Nick Diaz, and Gilbert Melendez for their upcoming fights, as well. There is no time table as of yet for when McGee could return to training or fighting, but it won’t be before June 11, forcing him to withdraw from the fight against Bongfeldt. The UFC has yet to make an official announcement about McGee’s removal from the card, but Bongfeldt will likely get a replacement for the June 11 show.